Today I am publishing another granny square for my crocheted "Foggy Dawn Sweater Project," this time it is a "Granny Square No 5". Just like Channel perfume No 5, it is feminine and romantic. This square has a 3D feel to it, with the flower centerpiece. It is not difficult once you understand the concept. I have a quite detailed (what else is new?) video that will help you with grasping the construction of this design. I am sure many of you, who are fairly new to crocheting, saw variations of this 3D flower and wondered how it is done. 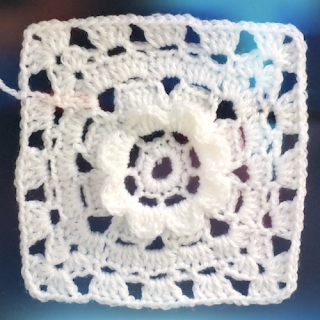 Do not let anything stop you from crocheting this 3D square. 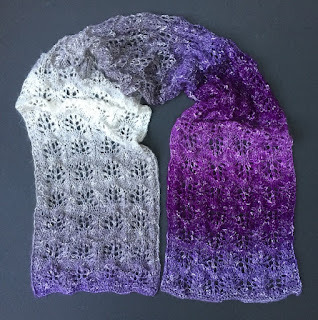 You can use it in any project no matter what weight of yarn, yarn type or color you chose. Use it for my sweater project, or make a baby blanket using as many "granny squares no 5" as needed. Give power to your imagination. Granny Squares - approx. 6"